Choosing the right fabric is key-- flat, bright white can sometimes look a little "nursey" and white eyelet can be a bit "jeune fille." Brunello Cucinelli The master of laid-back luxury knows how to use monochromatic texture to dramatic effect. Celine This romantic, portrait-worthy blouse provides the perfect counterpoint to soft ivory pants. 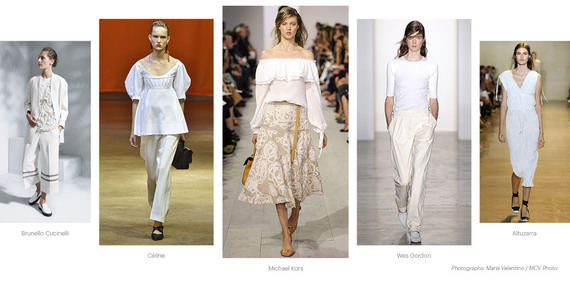 Michael Kors A feminine white peasant top meets its match with an easy, off-white embroidered skirt. Wes Gordon It doesn't get chicer than this: A neat stark-white tee with slouchy alabaster trousers and flats. Altuzarra A gauzy goddess dress perfect for packing. Just twist and roll. Attention to structure and "peek-a-boo" detail Check out the possibilities! We love this A.L.C. dress with its crochet work, lace-up front and semi-sheer hem; ditto, the T-shirt dress from T By Alexander Wang with its see-through bodice and hem; and the shadow-striped cardigan from Michael Kors. Minimal chic White has always won our hearts with its gorgeous simplicity. Calvin Klein's tailored long sleeve dress with draped back is one to buy now and wear forever. The Windsor blazer from Rag & Bone works with everything from jeans to a cocktail dress. And we couldn't resist the Melissa Odabash swimsuit--get ready for your Grace Kelly moment! All about the shoes & bags White accessories have never been such a must-have as now. Don't miss the beauty of a Comme des Garçons brogue (you can wear with jeans or a breezy dress), a kitten-heeled Louboutin pump, an affordable Barneys clutch or an investment-worthy Saint Laurent tote (to love all year-round! ).